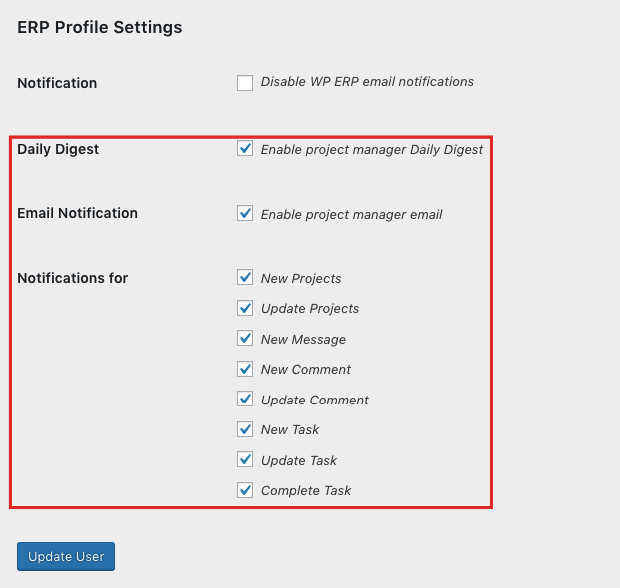 In WP Project Manager Pro, by default, the users of a task will be able to get notifications on the event of creating a new project, updating a project, sending a new message, adding a new comment, updating an existing comment, adding a new task, updating a task and completing a task. However, you can even restrict a particular user from getting the notifications on his/her email inbox. To do this, navigate to the WP Admin Dashboard → Users → Select a user. If you don't want to send notifications to this user for these items, then you can uncheck them and hit the “Update User” button to take an effect. You can also change the email from where the email is sent. To do so, go to WP Admin Dashboard → Project Manager → Settings → Email Settings. From Email: Enter the email from where the mail will be sent. Links in the Email: Check the box if you want to take the recipient to the backend of your site. E-mail Type: From the drop-down field, you can set the type of the notification mail either as HTML Mail or as Plain Text Mail. Send email via BCC: Check the box if you want to use the Bcc feature.